Monday? Again!?! Could time move any faster? The Great Monday Give for today isn't really rare, but still a sweet little book if you don't own it already. 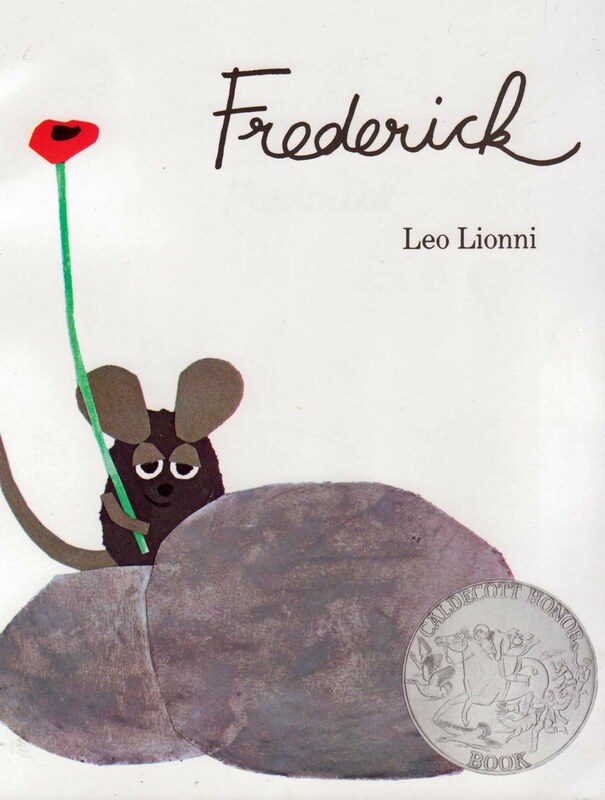 Up for grabs is a nice, already-been-loved paperback of Frederick by Leo Lionni. A classic. To be entered to win, all you must do is comment on this post before February 6 - Sunday - at 11:59 PM. A winner will be selected at random and announced the next morning. Congrats and please e-mail me your shipping info to webe(at)soon(dot)com. I can't believe we don't have that book -- I loved it as a kid! I loved Frederick when I was a kid--and am still drawn to the collage illustrations. Would love to share it with my son. we love leo lionni and missing this one! Frederick.... My sister drawn some illustrations and prepared a small book on construction paper for my little girl..We adore it! I don't remember reading this one, but am intrigued! i've always wanted to get this book! We'd love to add this one to our little library. Thank you for the chance at it. Love it! You cause me to spend all my pocket money on kids books. This is a great, new book that I have built many art lessons around. I would love to finally have a copy of my own! Oh what a beautiful book! We haven't read this one, but some of his others have been favorites. I need this one! Love Lionni. I would love to win Frederick! Please enter me in this giveaway. Is anyone too old for children's books like this one? :) Why do they even call them children's books? They should call them "everybody's books" since I think I enjoy reading them as much as my two daughters love sitting with me. It arrived yesterday! Thanks again! Z was very excited about it! I love Leo Lionni books. This is not one that we have in our library. I haven't seen this before and would love to see more! Every sunday I visit the flea market looking for old books. I once managed to find swimmy. It was one of the best findings. I love his work. Thanks for sharing! Oh, I remember this cover... I would love to win it!! I think it would make a very sweet addition to our family library... thank you for the chance. We would love to get this book! I loved Frederick and my daughter would too!! Frederick would be a great addition to our library! What a great book! We have loved checking this book out from the library, and I'd love to add it to our shelves!